Cornell University’s School of Continuing Education and Summer Sessions (SCE) is dedicated to providing outstanding educational opportunities throughout the year in as many subject areas and formats as possible for persons of all ages and interests. And if we don’t have what you’re looking for, we’ll help you design it. SCE offerings range from credit and non-credit courses to full-semester classes, one-day executive seminars, international programs, online classes, internship opportunities, youth programs, and education vacations on campus and abroad. The School is unique in the University for its ability to move quickly and flexibly in response to the changing needs and interests of our participants. Our classes are taught by Cornell faculty members; leaders in higher education, industry, and government; and distinguished scholars from around the world. 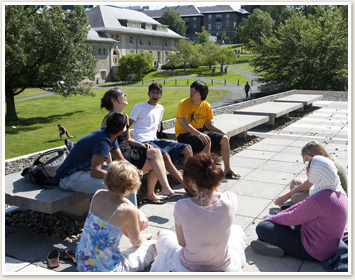 Our participants range from three-year-olds to high school students; Cornell students, faculty, staff, alumni, family, and friends; undergraduates and graduate students from institutions world-wide; international students and scholars; area residents; executives and professionals; and retirees. In addition to a broad range of academic programs, from the established to the experimental, SCE also offers a wide variety of summer concerts, lectures, and special events, which are free and open to the public. To learn more, visit www.sce.cornell.edu, e-mail cusce@cornell.edu, call (607) 255-4987, or write to B20 Day Hall, Ithaca, NY 14853-2801.